Waffles or Pancakes? That Is The Question! In our house waffles win hands down and Saturday or Sunday mornings, who am I kidding, even some evenings waffles are on the menu. 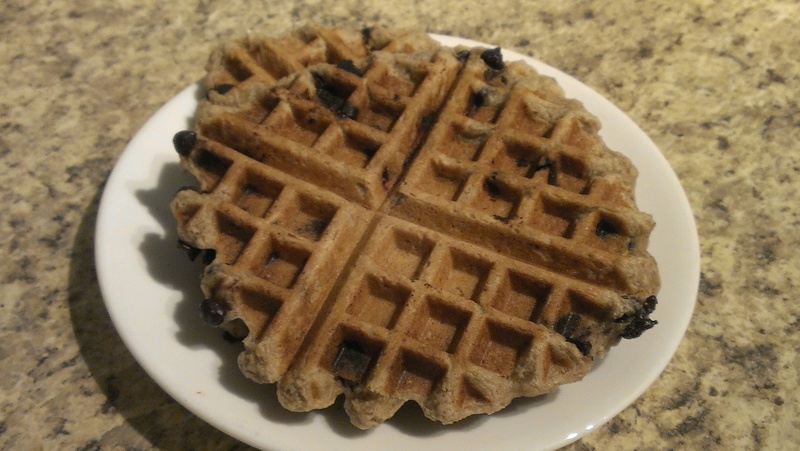 Today I want to share with you a waffle recipe that is vegan and gluten free. I make these often for the Monkey as I can freeze the leftovers and reheat them in the toaster on mornings where we are busy or on evenings that I know he isn’t going to want to eat what we are. I have used different varieties of fruit in these like chopped up fresh strawberries or even chocolate chips in place of the blueberries. Start by preheating your waffle iron. I have yet to try these as pancakes but I think they should work. In a mixing bowl combine all the dry ingredients and set aside. Add the wet ingredients to your mixing bowl and whisk together. I usually use a hand whisk when making waffles so that I do not over mix the batter. Fold in the blueberries and your ready to cook as per your waffle irons directions. 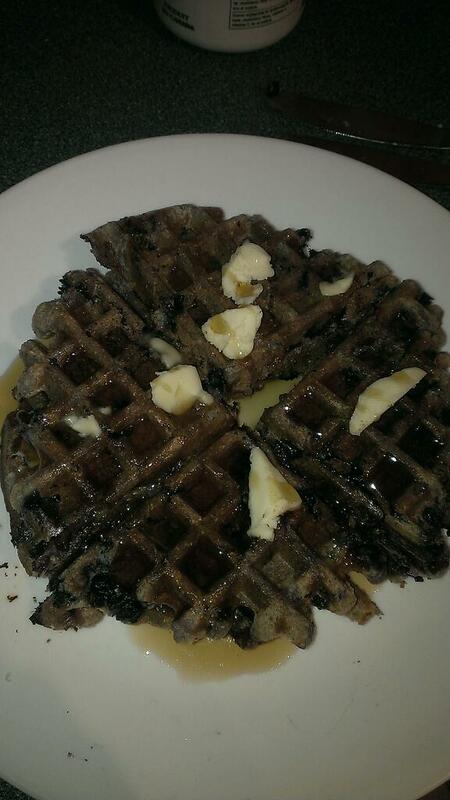 In my waffle iron it usually takes about 3 – 3.5 minutes for the waffles to turn a nice golden brown . In the picture above we had real maple syrup on these but usually I will make a fruit based sauce by heating 1 cup of frozen berries, 1 diced apple, 2 tbsp water and 2 tbsp of either honey or maple syrup in a sauce pan on medium high heat until the fruit is cooked down but apples are still firm. Then I reduce the heat to low and thicken by adding 2 – 3 tsp of tapioca or corn starch. Wish I had a picture of the sauce to show you but unfortunately you will just have to give it a try. I understand not everyone wants to participate in these awards, but I do hope you enjoy the recognition for all your hard work! Thank you so much for nominating us. We are absolutely honoured to accept the Leibster award and will try to do you proud by nominating some additional great blogs out there. We will get our nominations up this weekend. Thank you very much for this recognition!